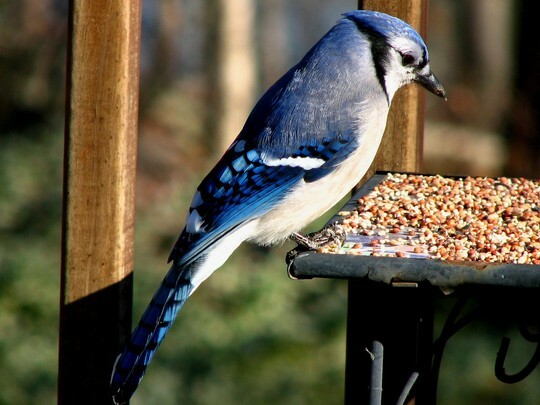 This is the eastern bluejay. Stunning photo Jerrie of a beautiful bird..........it's a privilege to see him...thank you. Gorgeous bird and great photo! Beautiful markings, what a specimen. Adding some of your bird pictures to my favourites too! Thanks everybody ~! He is a handsome devil, and he is one of our larger woodland birds. He will get 11 1/2 inches long at maturity, believe that's 29.21 centimeters. Glad to hear they are migrating over the rockies Gilli, now if the western Steller Jay would just migrate my way, I'd be tickled pink ! I'll box up a couple and send them your way Flcrazy and you do the same with your blue jays to me. LOL. The Stellar Jays are very pretty. I got a few shots of some from Yosemite a while back. What a stunning "electric" blue. Lovely photograph. Gilli, sounds like you're onto something good here ! Ahhhh, the beginnings of a wonderful plan.... hatch, hatch....thoughts are hatching in my brain as we speak....hehe. Yes Magnolia he is eye candy on a dull lifeless winter day, so much fun to watch. Tasteyg, I remember those photos vividly, and I'm still jealous...lol. You have taken some really beautiful bird pics. I love looking at them. Well GT once I figure out how to get some blue Jays to Gilli in British Columbia, I have her pass a few of them on up your way ! Thanks Lisa, I'm on my way to your site now to check out the photos you took on your 'vacation' day ! Thanks for the kind comments Sewingkilla and Pottygardener, He's one of our most colorful blue birds. Another great pic! I love the bluejay's raucous call!.Their squawks... are legendary! I always think they sound like a Nike bird ...."DO IT!" " DO IT!" lol... .. they are mimics too! if they want other birds to leave the area they will mimic the call of a hawk...! very smart for a birdbrain! lol... GT's comment about the gray jay made me wonder if there are Northern Shrikes there as well....or are they the same species?? ?...Shrikes are known as butcher birds...they will impale their prey on a thorn or twig ...they eat smaller birds, mice and amphibians! Very interesting bird.